It’s now one hour to midnight. Sixty minutes to destiny. It’s the last night of September, 2008. 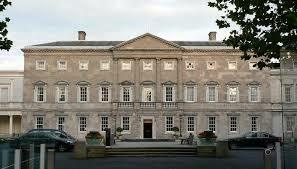 On this night, Government Buildings play silent witness to the unravelling of Irish history. The drama unfolds as the citizenry prepares for bed. The main players in this tragedy scuttle about shrouded by darkening skies, as if the absence of light somehow justifies their impending act of financial treason. Now it’s 30 minutes to the end of times. Time ticks down fast and hard. The blade of fate is about to thunder down on the nation’s neck. It’s a cold night outside, about 3 degrees. Even the weather is unkind tonight. Yet, nature holds no grudges against the country’s population, nor does it have any hidden agenda, unlike the characters who, acting purely upon their own selfish instincts of self preservation are about to demolish the hopes of an entire nation and lay waste to a whole generation of Irish. Ten minutes to the threshold of madness. 600 seconds. Things happen faster now. The players of Ireland’s ill thought out financial final solution gather around the table, and talk. It is now two weeks earlier. Lehman Brothers bank, once a mighty titan, spectacularly collapses and goes bankrupt. Nobody expected this to happen, nor had it even been considered by anyone as a possible outcome. At the other side of the Atlantic, Anglo Irish Employees watch their Lehman colleagues hurriedly exit the building carrying their belongings inside cardboard boxes. The writing is on the wall. Around the table, a cabal of bankers and government representatives discuss the half truths and outright lies of a banking system that has reached critical mass. An unstoppable chain reaction is about to take hold of the country’s financial pipework, its momentum reaching terminal velocity in a matter of minutes. It is 2007. The so called credit crunch. Irish banks have lent beyond deposits taken and their liquidity has evaporated. The void within the system grows larger with every passing day. The issue of Irish banking turns into a poisoned chalice, and soon we will all be satiated from it. The traitors talk, because that’s what traitors do. The traitors also lay blame on others, and assume no responsibility for the government-sanctioned piece of abhorrent legislation christened as the Bank Guarantee. It’s just what must be done to safeguard the soundness of Irish banking. Within five minutes, they will rubber stamp a nation’s generational burden of around €64 billion. The financial death knell for Ireland is about to toll loudly from within Government Buildings. It is now September 29, 2008. 24 hours before the end of days. Two well known players of the Irish financial landscape, Sean Fitzpatrick and David Drumm, scuttle about Dublin’s city centre calling at doors behind which they know money is plentiful. It’s cash they’re after, plain and simple. During the month of September, ever since those Lehman employees streamed out of a fallen giant, Anglo Irish Bank has been hemorraghing deposits to the tune of €1 billion a day. The bank’s shares are next to worthless, having lost about 46 percent of their former value. If money is not found pronto, the jig is up in two days’ time at best. This is a last ditch attempt to save an apostate idol. Fitzpatrick and Drumm enter and exit these financial institutions via back entrances. There is no fanfare or red carpet receptions. An outside spectator could be forgiven for thinking they were the fax machine repair guys. Yet, these people’s one track mind deviated not from their one and only desire; money, and fast. And yet, their requests are politely turned down, first by Bank of Ireland, then AIB, and finally by Irish Life & Permanent. Anglo’s lack of liquidity and inability to offer collaterals are quoted as reasons for this denial. The thwarted and deposed kings are pushed against a wall with nowhere to go. Hopes of a last minute solution to Anglo’s monumental debacle vanish into the ether. The fate of a nation has been sealed. The meeting at Government Buildings is in full swing now. Beside Fitzpatrick and Drumm, representatives from Bank of Ireland and AIB are also in attendance. There is no time for niceties, nor there is time to consider the ramifications that a wholesale bank guarantee will have on the Irish nation. All there is time for is getting the Government to cough up the dough, and take an Everest-size pile of private debt off their backs and politely mount it on the saddle of the Irish peoples as a whole. In a well-rehearsed pharisaic act, the bankers lay their demands in front of the purse holders. It is now two minutes to midnight. One hundred and twenty seconds upon which the future of Ireland rides headlong into darkness. The bankers end their exposition. If the money is not forthcoming, the Irish banking system will face the business end of the financial Grim Reaper’s scythe in a matter of days. They must act. Now. And guarantee every last unsecured penny in circulation. It’s one minute to midnight now. The detonation of the Bank Guarantee nuclear device is imminent. The seventh seal is about to be broken, and a cohort of angels shall blow their trumpets one after the other. Like Abbadon, the Irish Government shall hail a far-reaching, nationwide plague of financial pestilence. Posted on June 2, 2015 June 2, 2015 by d4hakkaPosted in My life as a journalistTagged articles, bank guarantee, infamy, irish water, leinster.